Triglav is not a mountain, it’s a realm! 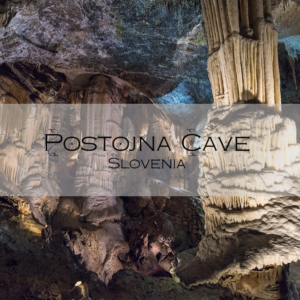 After our visit to Škocjan and Postojna Caves, we headed to Tolmin, a small town in Slovenia, for the night. 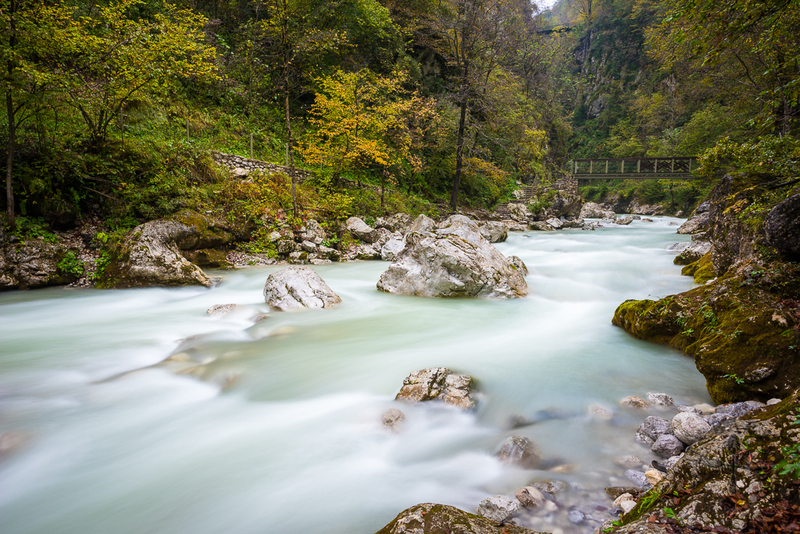 We checked out early the next morning to drive to Tolmin Gorges for a morning hike, which is located at the most southern part of the Triglav National Park. 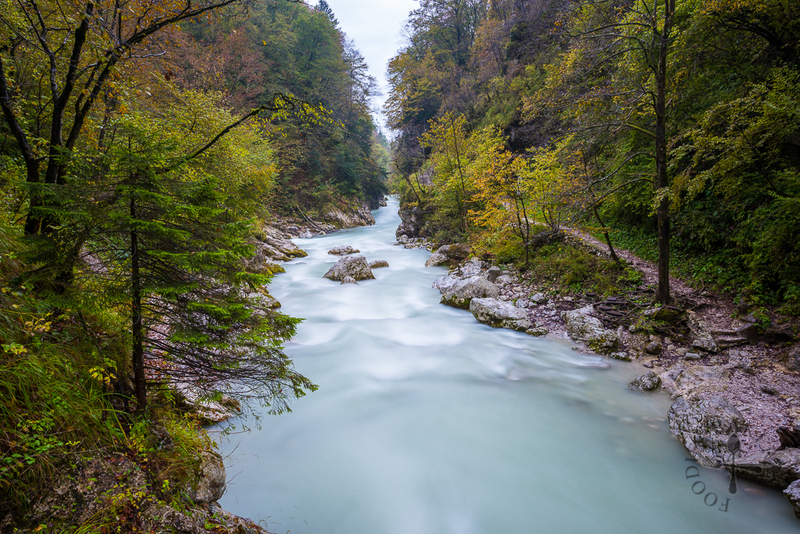 Established in 1981, Triglav National Park is the only national park in Slovenia, though efforts to protect the area started in 1924. Named after the mountain Triglav (the highest mountain in Slovenia at 2,864 metres), the park covers an area of 838 km² along the borders with Italy and Austria, which accounts for 4% of Slovenia’s total area. The parking for Tolmin Gorges is right at the entrance and is free for all. There is a small wooden hut at the gorge entrance where we paid the entrance fee. Building of the tourist path through the gorge started in 1953 and was completed in 1958 by the Tolmin Tourist Association. 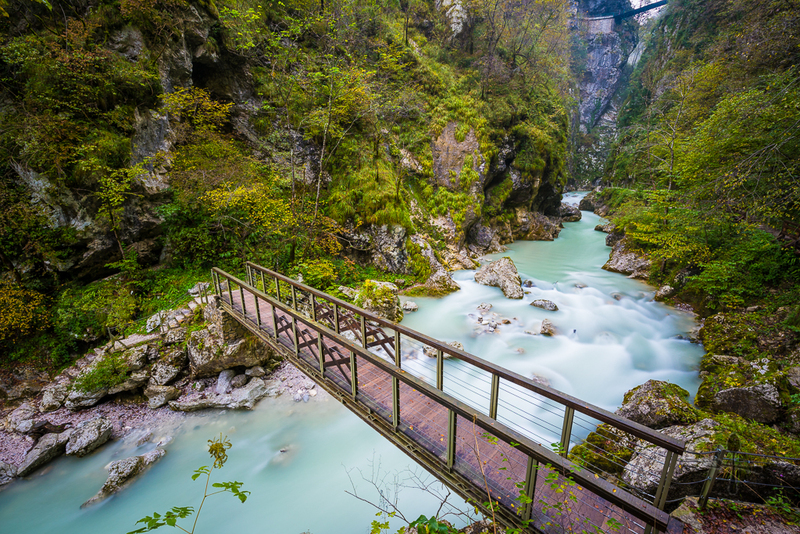 The entrance fees go into the maintenance of the trail in Tolmin Gorges. The extremely friendly ranger in the hut gave us a brochure (which included a map and information) and explained to us how to go about doing the hike. We followed her advice and hiked downwards via the hiking trail to see the gorge. 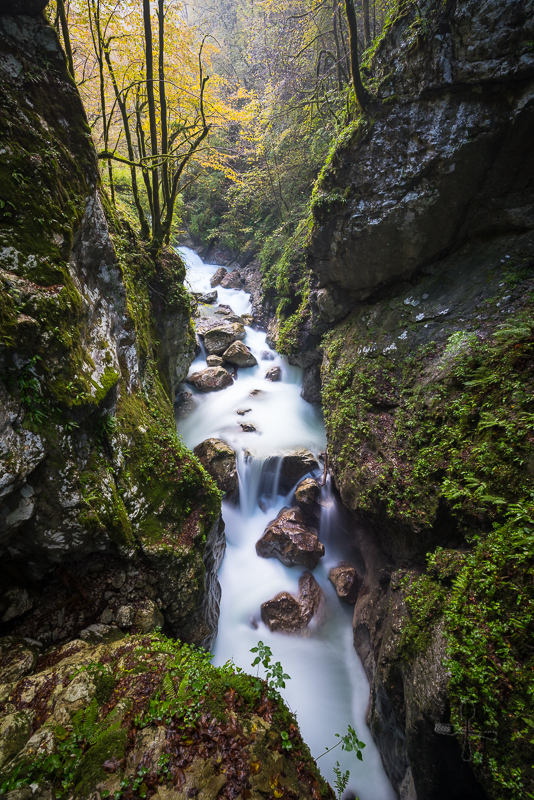 Tolmin Gorges is actually two gorges, formed as a result of geologic uplifts and erosion from two rivers. 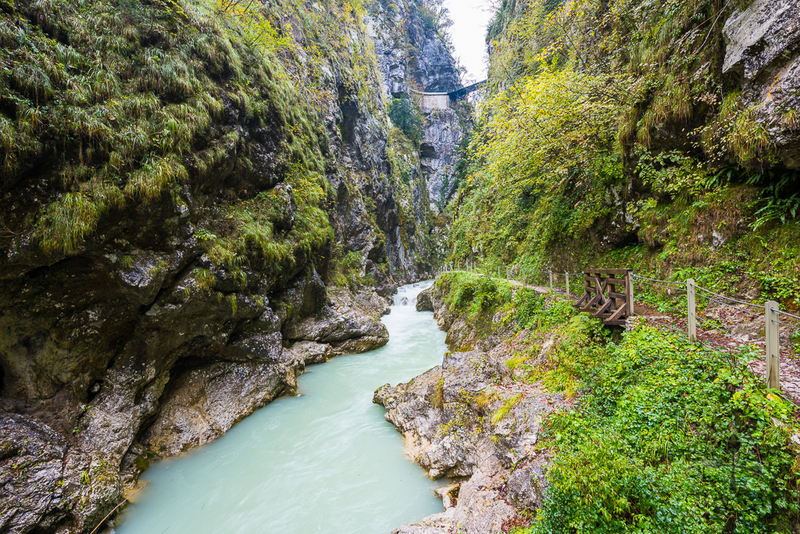 The Tolminka Gorge (carved by Tolminka River) is approximately 200 metres long, 60 metres deep and 5 to 10 metres wide, while the Zadlaščica Gorge (carved by Zadlaščica Creek) is shorter at 100 metres long, 50 metres deep and 3 to 10 metres wide. 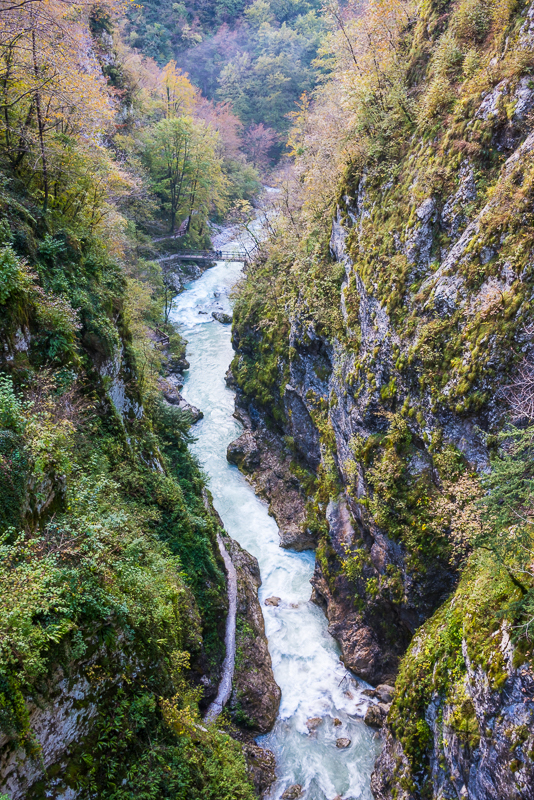 The confluence of both rivers, known as Sotočje, is lies at approximately 180 metres above sea level, the lowest point of Triglav National Park. Originating from the French word gorge, which means throat or neck, a gorge is a narrow valley with steep, rocky walls. 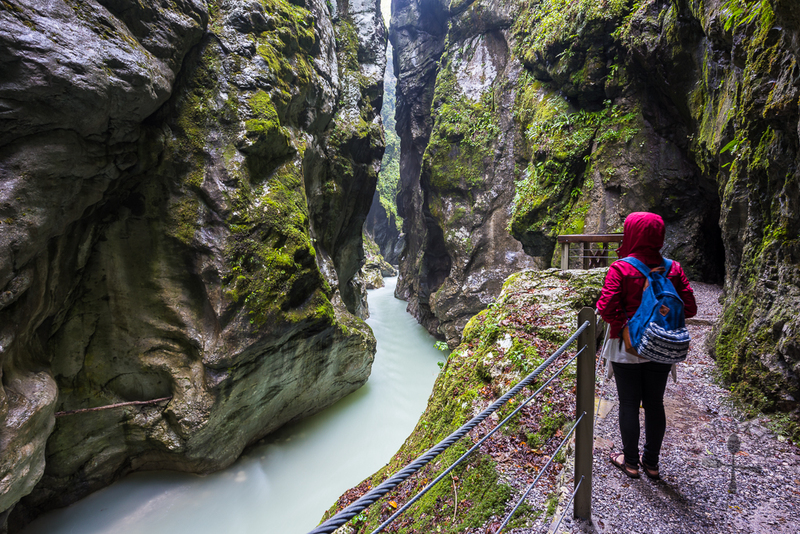 A gorge is typically smaller than a canyon, though both words mean the same thing. Erosion due to streams or rivers, geologic uplifts or the movement and melting of glaciers are what usually forms gorges. 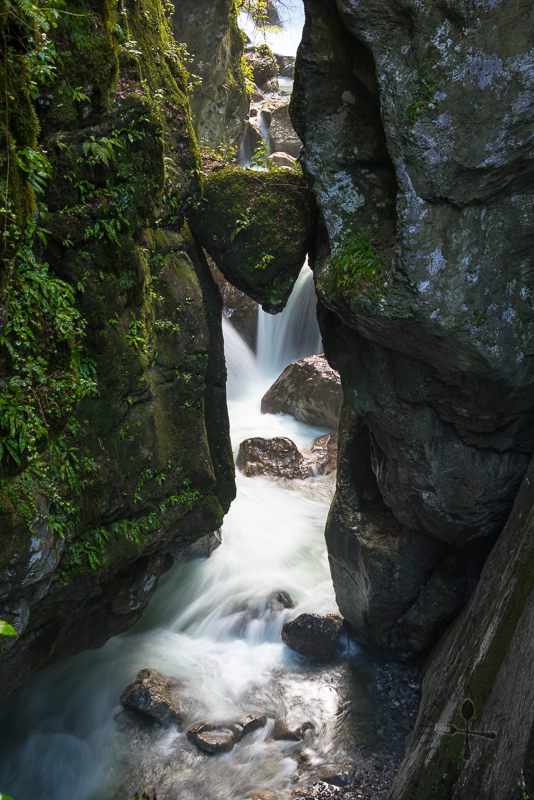 Streams and rivers carve through hard layers of rock, breaking down or eroding it, forming the steep walls of a gorge. Geologic uplift is the upward movement of the Earth’s surface, often associated with earthquakes and orogeny (the process of creating mountains). During geologic uplift, the rock layers beneath the Earth’s surface bump against the surface layers, causing the softer layers of surface rock to erode. Glaciers cut deep valleys, and when they retreat or melt, a gorge is exposed. 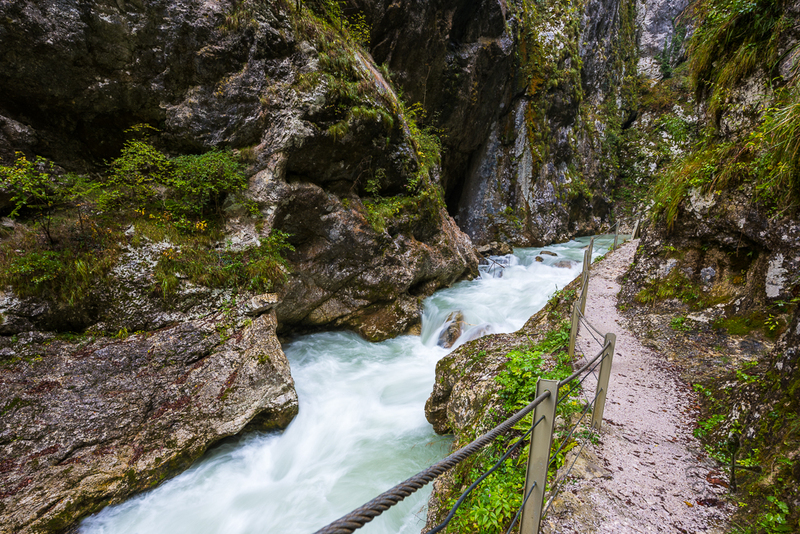 We first hiked along the Tolminka Gorge to the end of the walking path, where there is a thermal spring in a small cave there, with temperature ranging 18.8°C to 20.8°C (the river’s temperature is 5°C to 9°C). When water from the surface penetrates the ground, it is heated by geothermal energy and resurfaces through the crevasses and cracks. Due to rock fall which created a barrier and raised the riverbed of the Tolminka River, the cave can no longer be entered. Today, the spring can only be spotted when the water level of the river is low enough (we couldn’t spot it at all). We backtracked and soon reached the bridge we crossed earlier, then make a turn to hike along the Zadlaščica Gorge – can you spot Hudičev Most (Devil’s Bridge) at the top of the photo? This was my first time at a gorge and it’s incredibly beautiful – the clean and blue water, steep and almost vertical cliffs and the abundant vegetation (with a hint of autumn colours) formed stunning and photogenic images everywhere. We walked along Zadlaščica Gorge to reach Medvedova Glava (The Bear’s Head), a natural bridge that no one knows when and how it’s formed. It’s actually a large rock which got stuck between the walls of the Zadlaščica canyon and is 60 metres high above the rushing river. With the rich vegetation surrounding the rock, it made the rock looked like a hairy bear’s head (hence the name) to the locals, though to me it doesn’t look like one at all. It’s not possible to cross the bridge – well I wouldn’t dare to do so even if it’s possible! We backtracked from the Bear’s Head a little, then hiked up to head back. As we were descending at the start of the trail, we now had to climb back up. The climb was a bit strenuous, and we finally reached a bridge, the Hudičev Most (Devil’s Bridge). The bridge was built by the locals during the construction of the Bohinj railroad at the beginning of the 20th century. The first bridge was made of wood, but it was replaced by steel construction during the Italian occupation. Devil’s Bridge is a common name for bridges in Slovenia that cross dangerous and narrow hollows. After crossing the bridge, we walked along the road back to where we started. We didn’t visit the restaurant at the place and headed off for a nice drive along the road – which will be in the next travelogue! Leaving you with some information of the place! 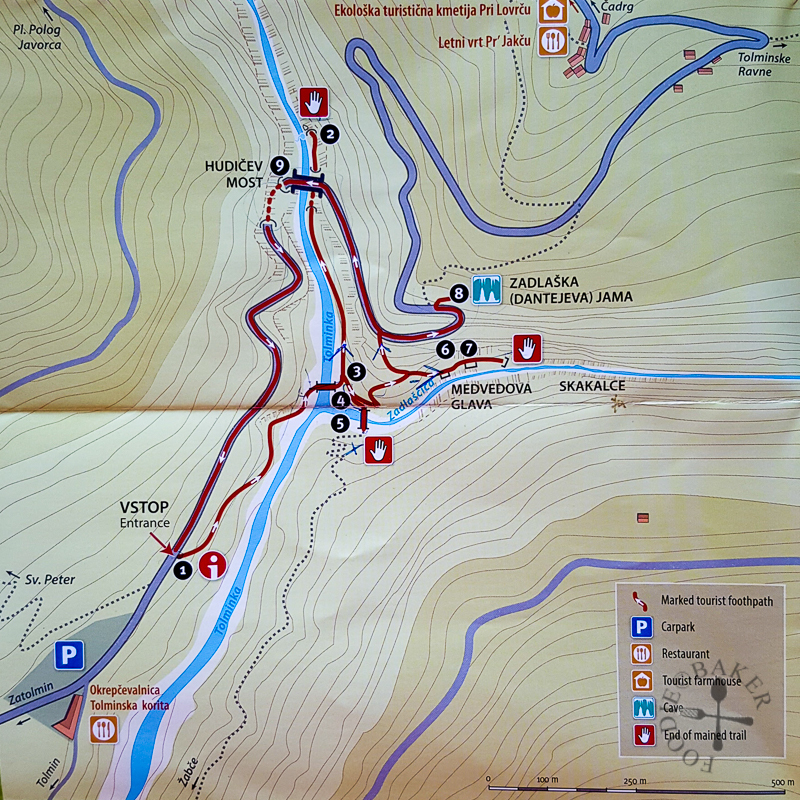 Above is the hiking map of Tolmin Gorges. 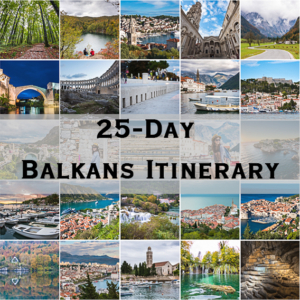 Points mentioned in the blog post are (1) Entrance; (2) Thermal Spring; (4) Confluence of the two rivers Sotočje; (7) Medvedova Glava (The Bear’s Head); and (9) Hudičev Most (Devil’s Bridge). We hiked from (1), crossed the bridge at (4), and hiked to (2). We backtracked to hike up to (5) for some photos, then back down to (7). We then backtracked a little then turn right to hike upwards to reach (9), then walked the paved road back to (1). The path is well signposted so it’s impossible to get lost! That place is *gorges*…(joke). But seriously, Beautiful place! Stunning pictures of my beautiful country. Thank you. I agree! Love the silky smooth water flowing. What a view of this part of Slovenia that we probably won’t get to see that often! You are so lucky to be able to travel the world! Absolutely gorgeous! Looks like a quiet and beautiful place to meditate. What are your camera settings for the fast moving water shots. So beautiful? What gorgeous photos of the gorge. I’ve never really seen much on Slovenia so this is really lovely!